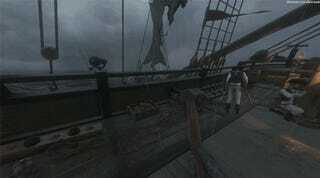 Blackwake is a multiplayer FPS game all about naval battles. You have a crew, and you have a captain. The question is: can you come together and work as a team? You and your crew are in charge of every aspect of a ship, including loading/firing cannons, repairing holes and sails, manning the pumps, and boarding the enemy ship. The captain can give the crew commands and orders, but it’s up to the crew to carry them out. You can name and customize your team’s ship. You can overthrow your captain. You have an “assortment of 18th century firearms” at your disposal, though it looks like you can get creative with what you use as a weapon. The game is match-based, and will feature different types of objective modes including assaults on enemy ships, defending your own ship, capturing the treasure, and more. The weather and landscape system is robust, allowing you to experience everything from storms, to ice bergs and sandbars—which will affect your game. Right now the project aims to raise $7,305 so it can release on PC and Mac, and it’s already pretty close to that goal. Alternatively, you can watch uncut gameplay footage of the alpha here, courtesy of ngotie—it looks sweet! Do note that these players seem to know what they’re doing, too, which means these matches are more intense than they are hilarious.